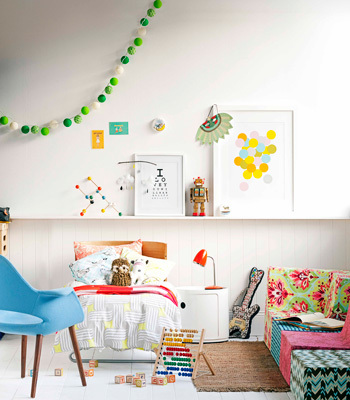 Mix and Chic: Double duty kids' rooms inspirations! 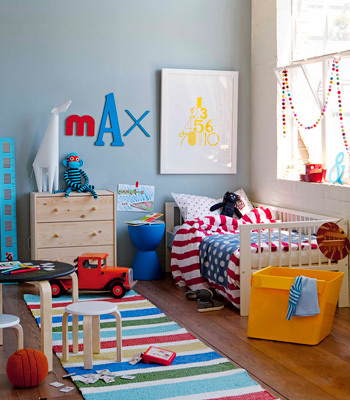 Using versatile furniture and accessories in a child's room is a great way to update a room in an affordable manner when a child is transitioning from childhood into teen years. It's easy to create two looks in one room with something old through reusing and repurposing while incorporating something new and inexpensive. Can you spot the difference between the rooms? I just love the nursery in room #1. It's looks so fun and modern. What about you? These rooms are adorable!!! YES room #1 is my favorite- that is the coolest toddler bed ever! And then it looks like they just took the back piece off to be a regular bed. Love it!! Seriously...this makes me want to have kids RIGHT NOW! 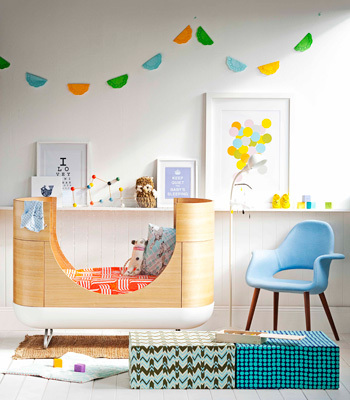 The baby's nursery bed is so cute. Shelli, if you follow the link at the bottom of the last picture, you will find all the information regarding the resources for the crib, beds, artworks, etc. So cool! I want the headboard in the girls room, it reminds me of a peacock feather - fabulous! !